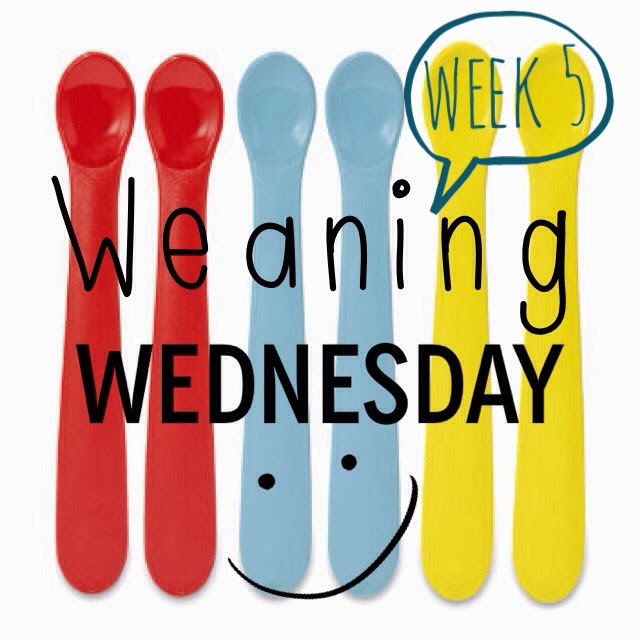 I hope my top tips last week were useful to any mums thinking about weaning at the moment. We're five weeks in now and Ethan is still feeding really well. He's had a couple of days where he's only had two rather than three meals, either because it's been a busy day or because his routine has been disrupted due to teething (still no sign of those toothy pegs but it can't be long now - he's had a couple of troubled evenings where they've really been getting to him). This past week, he's had some meat mixed in with his vegetables once or twice a day and he still seems o be wiling to try anything. He has been a little constipated I think the past couple of days but nothing too bad at all and fresh fruit has helped with this. 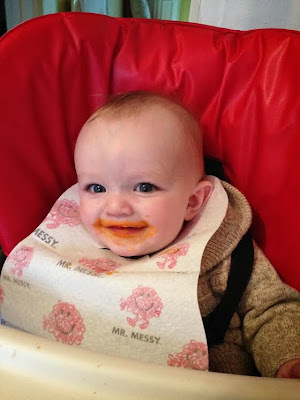 Banana and mango or apple and pear is his favourite breakfast and he's enjoying butternut squash and swede too, both of which are easy to prepare for him. I've even started adding a few more lumps, so he starts to get used to food that is more food shaped than complete mush! 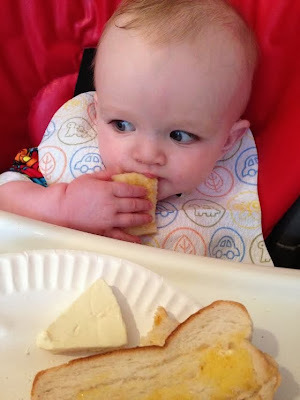 I went to a baby led weaning class a few days ago, held at the children's centre we go to and run by a health visitor, just to pick up any new tips or ideas. 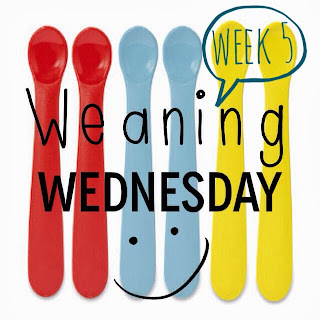 The other mum's there had much younger babies and hadn't started thinking about weaning so it was particularly useful for them but for me, it actually made me feel a bit bad about feeding Ethan the way I have been which is crazy. Because the health visitors seem to be insistent on pushing baby led weaning on new mums, it made me feel like my way was wrong. 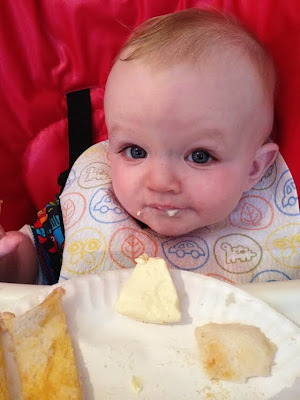 Despite the fact that he eats homemade food 80% of the time, has never turned his nose up at anything and his growth and weight gain has been right on track, I left the class feeling like I had failed my son in some way. I tried feeding Ethan the baby led way, by putting some fingers of toast and Dairylea on his tray for him to play with and hopefully eat, but he really didn't seem to get it and after half an hour, he hadn't made a dent on his food. 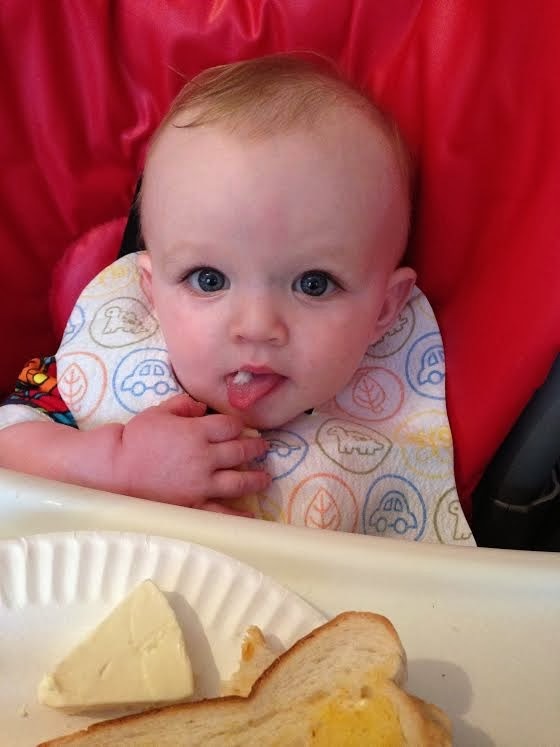 I know these things take time but at the moment, he seems happy to explore food in his own way and at least if I feed him, he gets to actually eat different foods. When we had him weighed on Friday, the health visitor there made me snap out of my downbeat attitude. She said that he was a very healthy weight, he was obviously happy and sleeping through the night was a great achievement which many of the other babies his age have yet to accomplish. Woo, I wasn't a bad mum after all! Everything is a learning curve and sometimes, you really can have too much advice, too many opinions and too many conflicting theories. 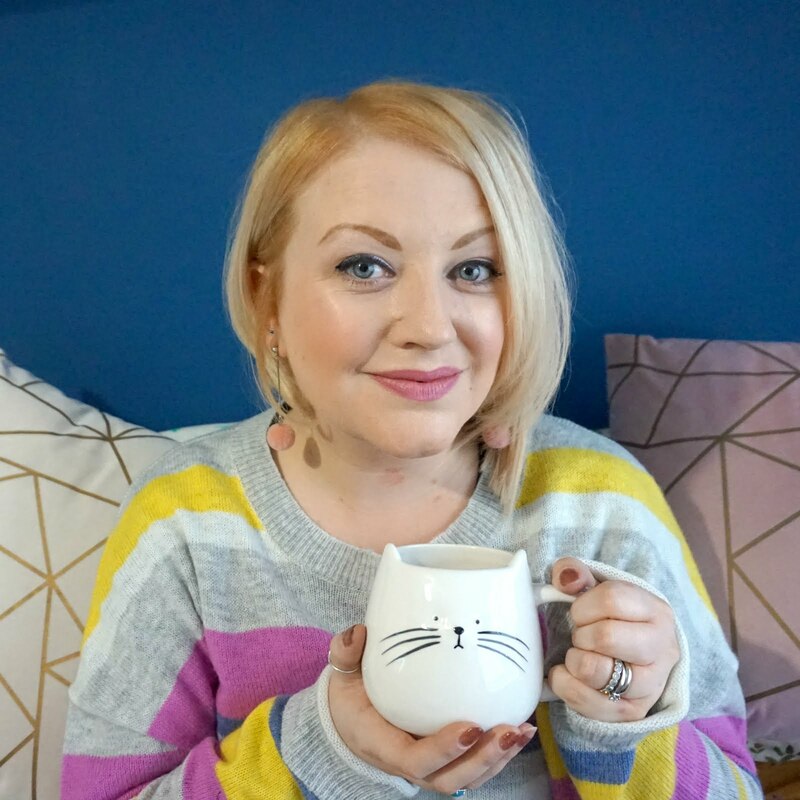 What I've learnt and what any mum needs to realise is that they are the only people who truly know their baby and as long as you're led by them, in terms of when they're hungry, what they want to eat and when, then you ARE doing the right thing, whatever you want to call it.